One thing you must know about the metal roofing on your Queens home is how you can ensure proper ventilation because a metal roof with insufficient air circulation can experience many problems, such as heat and moisture accumulation, mold and mildew growth, and poor energy efficiency. If you suspect that your metal roof is inadequately ventilated, have an experienced Queens roofing contractor examine your roof and attic. Static ventilation is a process in which hot air rises and exits through exhaust vents while cool air enters through intake vents near the eaves of a roof. A balance should be created between the air exiting and the air entering the attic so that a continual circulation of natural airflow is developed. A ratio of 1 square foot of ventilation for every 300 square feet of attic is required by the United States Department for Housing and Development for adequate airflow, but a ratio of 1 square foot of ventilation per 150 square feet of attic is recommended by many roofing experts. If a ventilation system is unbalanced, heat and moisture can accumulate in the upper section of the metal roofing and attic. If the system is ineffective at eliminating this hot and moist air, the metal roof and attic’s energy efficiency decreases. Condensation can also develop, fostering an optimal environment for mold and mildew growth on insulation and other roofing and attic materials. How Do You Improve Roof Ventilation? To ensure that your roof is ventilated properly, you should uncover all intake vents, and test the air circulation in your attic with a smoke pen or a piece of tissue paper. Additionally, your roofing contractor can help you create a pressurized system so that more air flows through the intake vents than through the exhaust vents if the vents can’t be balanced perfectly. Some homeowners choose to install different types of vents, including turbine and roof ridge vents. Turbine vents have fans that are activated by breezes in the attic, and hot air is forced out as a result. Roof ridge vents, on the other hand, are stationary, and your roofing contractor won’t have to cut into the metal roofing to install them. Instead, your roofer will leave a gap along the ridge of the metal roof and install a vented ridge cap and additional metal roofing over the gap and ridge. 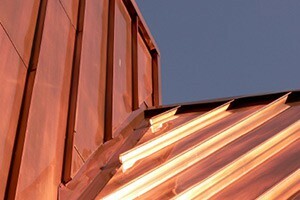 To prevent damage to your metal roof’s structural components caused by heat and moisture, hire a roofing contractor like Eden Queens Roofing Contractors so that you can work with skilled roofers to improve the ventilation of your Queens home’s metal roof. If you are looking for a metal roofing contractor in Queens, then please call 718-819-7700 or complete our online request form.